An outstanding first quarter earnings season is winding down. With 455 S&P 500 Index companies having reported first quarter 2018 results, index earnings are tracking to a 26% year-over-year increase, 7.5% above the 18.5% estimate as of April 1, and one of the biggest upside surprises of the entire economic expansion. The new tax law is giving earnings a big lift, but growth and upside would be impressive even absent that impact. Revenue has also been strong, tracking to an 8.2% year-over-year increase, well above the prior 7.3% estimate. Guidance has been supportive during reporting season amid a solid economic growth outlook, evidenced by the near 1% increase in earnings estimates for the next four quarters. See this week’s Weekly Market Commentary, due out later today, for an earnings season recap. How worried should we be about peak earnings growth? First quarter earnings growth of 26% may be as good as it gets for this cycle, but how worried should we be if that is the case? To answer that question, we went back and looked at the past 12 earnings growth peaks spanning 65 years to see how quickly the next recession arrived. We’ll have the data later today on the LPL Research blog, and the results might surprise you. Oil likely to stabilize; Middle Eastern geopolitics remains a wild card. Oil prices have been pushing higher in the wake of the announcement that the U.S. will be withdrawing from the Iran nuclear deal, but we believe prices are likely to stabilize as oil markets absorb the news. Estimates put the impact of the renewed imposition of U.S. sanctions on Iranian supply at 200,000 to 1 million barrels a day, but spare capacity among OPEC nations and non-OPEC partners who cut production, as well as production growth in the U.S., should be able to make up much of the gap. Fear of supply disruptions from elevated Middle East tensions remain a concern, but are not in themselves further disrupting supply. Consumers bear the brunt of higher oil prices, especially those on the lower end of the income spectrum who spend a larger percentage of their income on fuel, but the impact of price changes thus far are small compared to the benefits of the new tax law and we believe are unlikely to disrupt broad-based consumer strength. Week ahead. Retail sales, industrial production, and the Leading Economic Index are among the key U.S. economic data due out next week; while Baker Hughes’ weekly rig count should garner attention as traders continue to monitor the U.S. production response to higher prices. 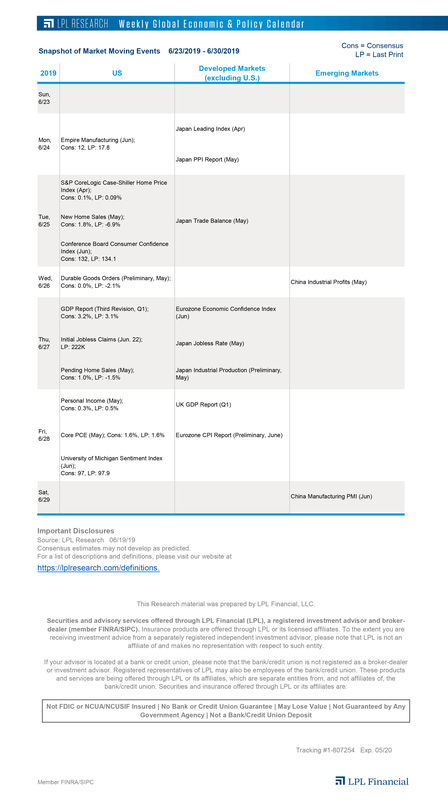 Elsewhere, inflation and first quarter gross domestic product data releases are slated for the Eurozone, Germany, and Japan. Eurozone trade balance figures and Germany’s ZEW Economic Sentiment report will also be on investors’ radars. NAFTA and China trade negotiations will also garner significant investor attention, along with several Federal Reserve speakers.